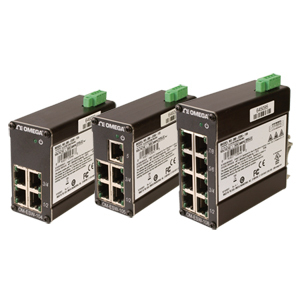 The OM-ESW-100 Series is a range of compact IEEE 802.3 layer two network switches with automatic speed, duplex and cable sensing. The series features ultra-robust construction, capable of withstanding environmental extremes for use in mission critical applications. These affordable, Class I, Division 2 switches feature redundant power inputs, hardened metal enclosures, and 16 kV port protection. Each switch is capable of auto negotiating 10/100 Mb and half/full duplex communications. All safety related regulations, local codes and instructions that appear in the literature or on equipment must be observed to ensure personal safety and to prevent damage to either the instrument or equipment connected to it. If equipment is used in a manner not specified by the manufacturer, the protection provided by the equipment may be impaired. For OM-ESW-108: Use 60/75°C rated copper wire, (0.22 Nm) 2 inch-lbs. tightening torque for field installed connectors. For OM-ESW104/OM-ESW105: Use 95°C rated copper wire, (0.22 Nm) 2 inch-lbs. tightening torque for field installed connectors. See PDF for detailed dimension information. according to EN50022 35 x 7.5 and 35 x 15. Note: All models come complete with user manual.